A great blanket for your stroller or every day use from Baby Bella Maya. This new introduction takes their popular plush blankets and makes them even more desirable by cleverly adding ties to the corners. 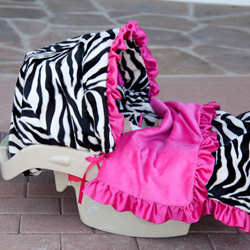 Now the blanket can be attached to strollers, car seats, infant carrier covers, etcetera, the possibilities are endless. Pair this convenience with an ultra soft plush blanket that is extremely comfortable to cuddle up in and you have a winning design. Measures 30" x 35".